Although the Moselle had been crossed and a solid bridgehead established, there was to be no rest for the 36th Division. For seven long weeks it struggled through the tedious, tiresome task of clearing German resistance out of the Vosges foothills between the Valogne and Meurthe Rivers to secure a line of departure for an attack over the Vosges passes. 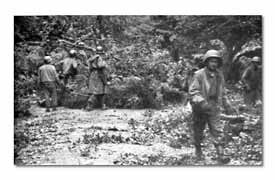 Tough terrain and cold weather collaborated with the Germans who fought bitterly to retain their hold on the hills. The "Forgotten Front" of Italy found a counterpart in the struggle for the Vosges approaches. 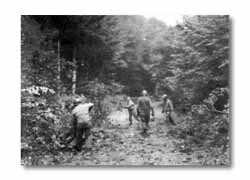 Mined and booby-trapped enemy roadblocks in dense forests of the Vosges had to be flanked by infantry through enemy brush before engineers could remove them. Cant hooks are used to roll logs off to the side of the road. 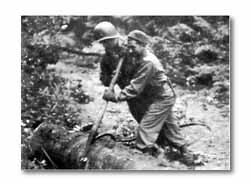 (Below) 111th Engineers clear remaining brush. No glamor or excitement eased the pain of the doughboy in this period. No single great battle acclaimed in the newspapers was fought. Because of the exposed position of the ever broadening bulge created by the Division, it was a period of battalion and regimental operations, but all battalions were involved and none received more rest than enough to get a bath about once in two weeks. German resistance at Le Tholy prevented the units on the right, initially the 3rd Infantry Division and later the 3rd Algerian Division of the First French Army, from coming up abreast. On the left there was a wide open flank covered only by patrols between the 45th and 36th Divisions. Thus the Division position stuck like a dagger into the German lines. 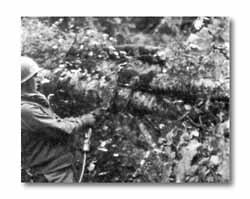 While on the left Division units kept pushing forward to close the gap with the 45th, on the right a fifteen kilometer stabilized flank had to be vigilantly maintained to beat off German attacks and probings. There were no reserves. Battalions which had "rested" in foxholes under the strain of unceasing patrol actions on the front between Herpelmont and the hills east of Tendon were used to relieve the battalions reduced by offensive actions on the left. These in turn were "rested" by taking up the vigil in the foxholes. Progress was painstakingly slow, often measured in yards. The fighting was not along roads and in towns. It took place on rugged, heavily forested ridges, in flooded fields, and in mud. By October 12 the area east and south of the curve of the Vaiogne River between Herpelmont, Laval and Docelles had been cleared by the 141st and 143rd Regiments. On the north side of the river the Germans had been pushed out of Le Roulier, Deycimont, Le Panges, and Fays. On that day welcome reinforcements began arriving. The 442nd Regimental Combat Team (Nisei, Americans of Japanese descent) was attached to the Division. During their single months stay they distinguished themselves in the capture of Bruyeres and of Biffontaine and in their gallant fight to relieve the 141sts "Lost Battalion." Engineer hooks chain and cable around tree to be pulled from roadblock.